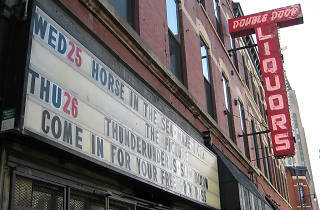 After months of legal battles, the Double Door's battle with its current landlord seems to have come to a very unceremonious end this afternoon, as the music venue was evicted from the building it has occupied for the past 23 years. DNAinfo reported that Cook County sheriff's police posted "no trespassing" signs on the Wicker Park building's doors while a locksmith switched out locks on the doors around 11:30am this morning. The lengthy legal battle between the Double Door's owners and landlord Brian Strauss began back in November 2015, when Strauss began eviction proceedings and alleged that Double Door owner Sean Mulroney did not give proper notice of his intention to renew the lease on the space. When the trial finally ended in June 2016, a judge ruled that the Double Door would need to vacate the building and gave the venue's owners until the end of 2016 to clear out. The impending closure of the Wicker Park rock club spurred co-owners Mulroney and Joe Shanahan to begin looking for a place to move the venue. The pair settled on a former bank building in Logan Square, submitting a proposal to turn the historic property into a venue featuring a "650 people concert area plus two bar areas with capacities of 229 and 120." But in October 2016, the Chicago Tribune reported that the Double Door was no longer facing an eviction on December 31, 2016 and would remain in its original Wicker Park home until it had exhausted all of its appeal rights. Signs that had been posted on the venue's potential relocation site in Logan Square were quickly removed (though a petition asking for support from Logan Square residents remains on the Double Door's website). The Double Door events calendar currently lists concerts and parties through the end of April 2017, but in light of the eviction, those that aren't canceled will not take place at the Wicker Park venue. 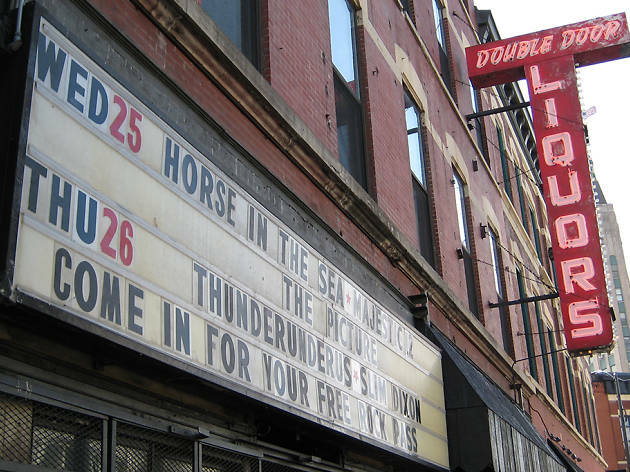 We expect to hear more about the Double Door's future plans (hopefully the owners will be able to save the club's iconic sign) in the coming days, including additional details about the venue's move to Logan Square. In the meantime, pour out a tallboy for one of Chicago's best music venues.